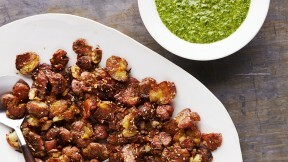 This smashed potatoes recipe appears in the "Side Dishes" episode of Martha Stewart's Cooking School. Make the herb sauce, if desired: In a food processor, combine cilantro, mint, pine nuts, and lime juice and zest. Process until finely chopped. With machine running, pour oil in a steady stream through the feed tube; process until smooth. Season with salt. Make the potatoes: Preheat oven to 450 degrees (230 degrees C). Bring potatoes to a boil in a large pot of salted water; reduce heat and simmer until just tender, about 15 minutes. Drain and transfer to a large rimmed baking sheet. Let cool 5 minutes, then lightly crush each potato with the heel of your hand. Drizzle generously with ghee and oil and season with salt and za’atar. Top with rosemary. Roast until golden brown and crisp, about 35 minutes. Serve with herb sauce, if desired.